Made of quality ripstop nylon sail, carbon fibre and fibreglass spars this kite will fly from the top of a kitepole whenever the winds is blowing and protect up to 10 acres. 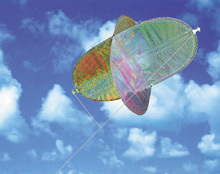 This kite has a wingspan of 1100mm and is flown from the top of a kitepole. Made of high-quality ripstop nylon sail, carbon fibre and fibreglass spars for maximum up-time and durability, the kite will fly whenever the wind is blowing and provide protection for up to 10 acres depending on the lie of the land.